pure+natural® stores offer food that is just that, pure and natural. We make everything daily. Our salads use fresh, natural ingredients; we prepare lean meats, offer premium breads and make fresh juices and smoothies from real fruit and vegetables. If you are passionate about good, real food and being your own boss then call us about opening a pure+natural® store. pure+natural® offers a ‘better for you’ range. We offer choices that taste fantastic and are better than some of the other fast food options out there. Consumers are more and more looking for food that makes them feel better. Our food is prepared freshly each day; with nothing artificial – and importantly tastes great. pure+natural® gives consumers tasty and ‘better for you’ options which makes them want to come back regularly. pure+natural® has been offering tasty, fresh food since 1982 and is well positioned to tap in to the growing consumer sentiment for better food. If you share our passion and enthusiasm for good food, we have the knowledge and experience to provide the systems, training and support to help you run your business. Starting a business with pure+natural® is easy, we have done all the hard work for you. We select the best sites and provide the right systems and ingredients for better food offer that consumers want and keep coming back for. From day one, we will be right along side you. Once your chosen site has been secured, we get straight down to the business of making the tasty, better for you food that have made us so successful. We don’t expect you to know how ... we will train you. 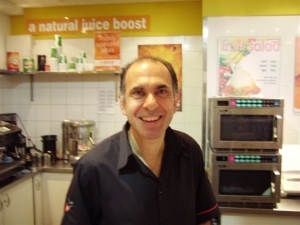 And to enable your franchise to become successful we will guide you through all the facets of managing your operation. Remember, if you are not successful, neither are we. It’s a team effort. The pure+natural® concept has been tried and tested since it was first established. We are highly successful because we strive to be the best, every day in every way. From our quality fresh ingredients to our high standards of customer service, we don’t accept second best. We look forward to you joining us and being part of the good food trend. pure+natural® helps select, negotiate and secure a lease of a store site. pure+natural® will design and help manage the fit out and the equipping of each store to meet pure+natural® standards. pure+natural® will help you manage your contractors fit out the store in a competitive manner. pure+natural® provides training to its franchisees covering all aspects of our systems, as well as assisting in the opening and running of the store. pure+natural® have carefully selected suppliers to provide ingredients and materials mindful of quality and cost. If you want to be your own boss and you have ambition, creativity and dedication to open your own pure+natural® Franchise, please contact our friendly Franchise Recruitment team on 03 9856 4400 or complete the franchise inquiry form below.